It unfolded like a red blanket, its distant peaks dancing in the heat. 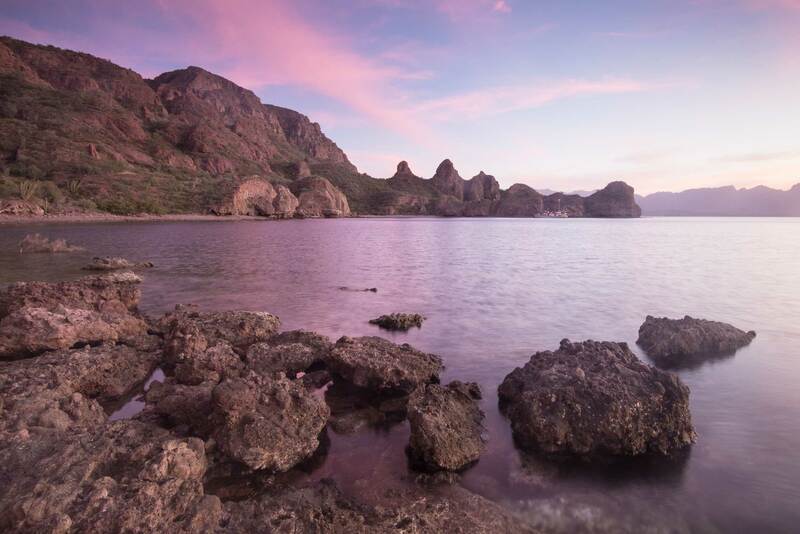 The cool waters of the Sea of Cortez lapped at its borders, but the desert seemed unmoved. Accustomed to the winter weather I had left behind that morning, I downed a salty-sweet limonata and gazed across the landscape, shielding my eyes from sweat and the intense sun. I’d never envisioned a place surrounded by water that could yet be so dry. I was a bit incredulous, but this was Captain Bill Bailey’s ninth year returning to Baja California Sur. He could clearly see when even this heat-stricken ecosystem was flourishing. 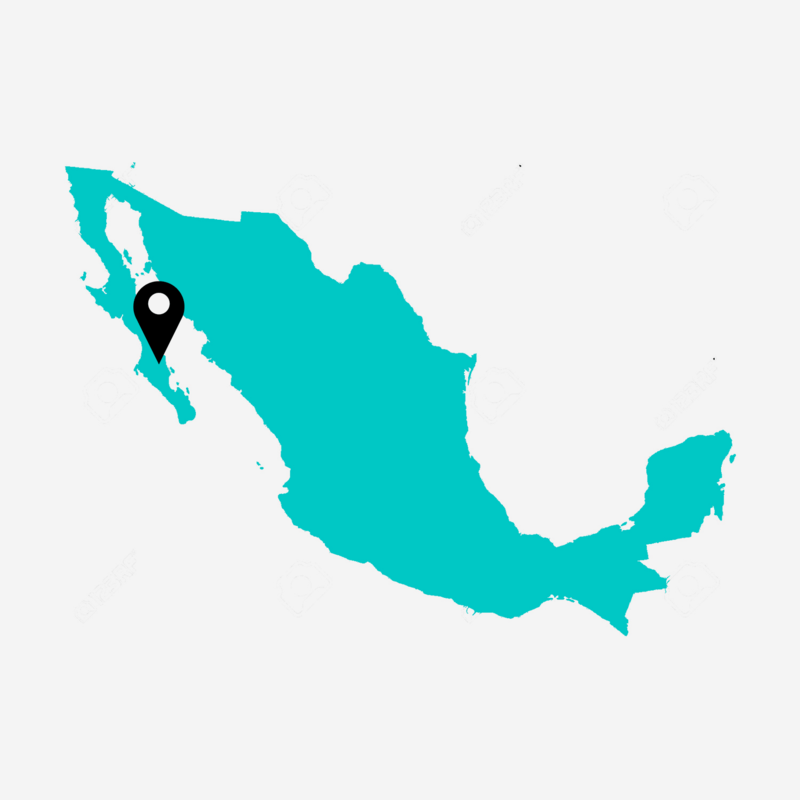 Bill’s ship, the MV Westward, was moored along a pier that straddled the line between desert and sea in the small coastal town of La Paz. The hand-crafted wooden vessel had once provided intimate cruises for early 20th century elite who were keen to hunt and fish in southeast Alaska. Although the Westward had been retrofitted over the past 90 years, stepping aboard had elements of stepping back in time — particularly as she was still powered by the 1924 Atlas diesel engine around which her hull was built. 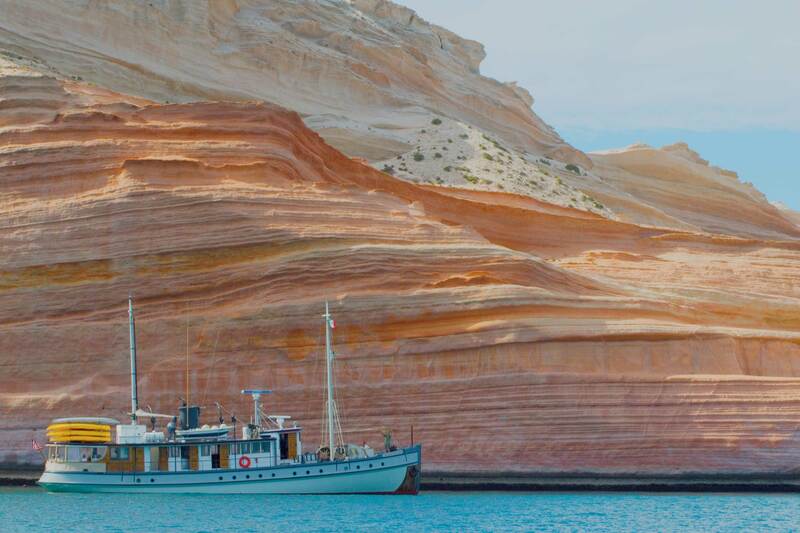 I was joining Bill, several other passengers, and a handful of crew for a ten-day trip between La Paz and Loreto. Given the small size of our ship and group, it was possible for us to eschew the big ports of call that attracted most cruise operators to Mexico. 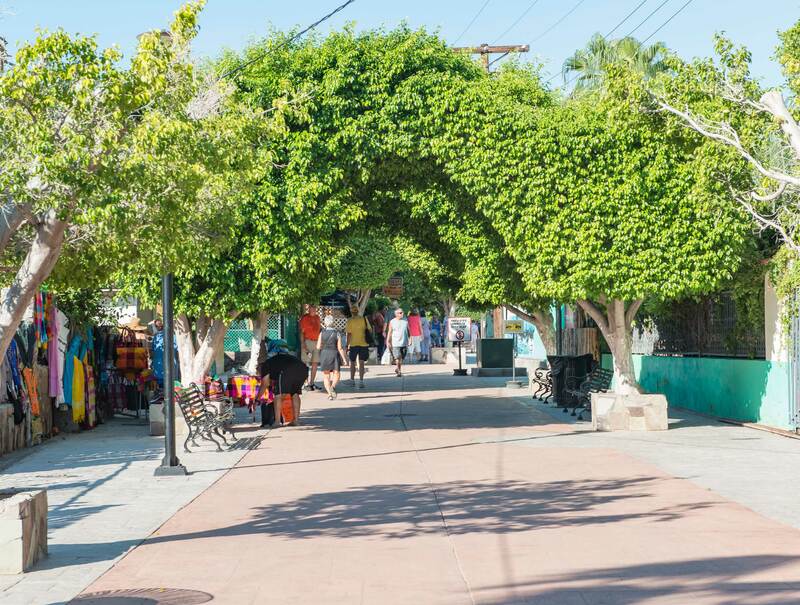 Instead, we would skirt Baja along the Sea of Cortez, following much of author John Steinbeck’s original passage along the peninsula seven decades before. At first light, the Westward freed herself from her moorings at La Paz and slipped off into the turquoise waters. We left behind the street vendors hawking coconuts and billboards proclaiming ‘Si estoy bien, no cambio’, and dined on poached eggs and fresh papaya as Bill steered us towards Isla Espirito Santo: Island of the Holy Spirit. Just off the coast, Espirito Santo’s cardon-covered slopes harbour a lagoon that served as a pearl oyster farm at the turn of the 19th century. The farm has since been abandoned by humans, but new residents have moved in. 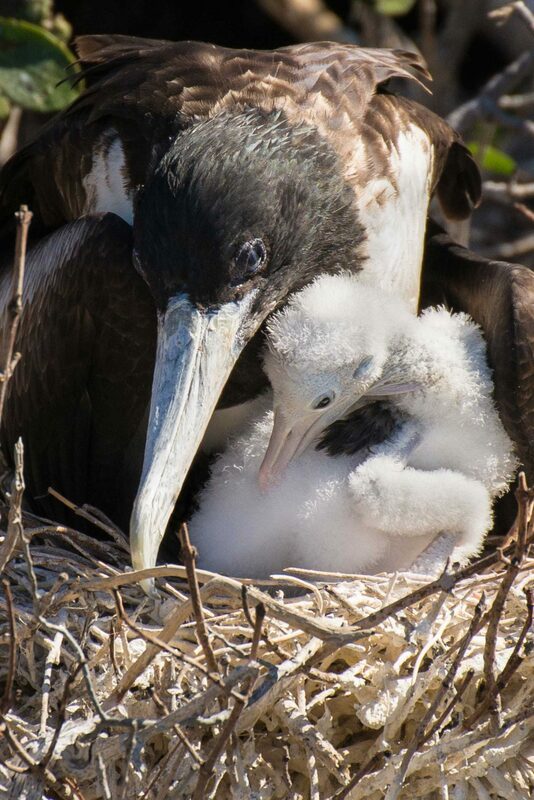 We heard — and smelled — them before we saw them: several thousand frigatebirds, wheeling, diving, and calling to one another in a cacophony of clicks and squeals. The males performed mating displays, inflating the bright red dewlaps on their throats until they swelled to the size of balloons. The females were mostly preoccupied with the hordes of chicks crying to be fed. We kayaked along a spit that had been bleached white by droppings, mesmerised by the city of birds before us. 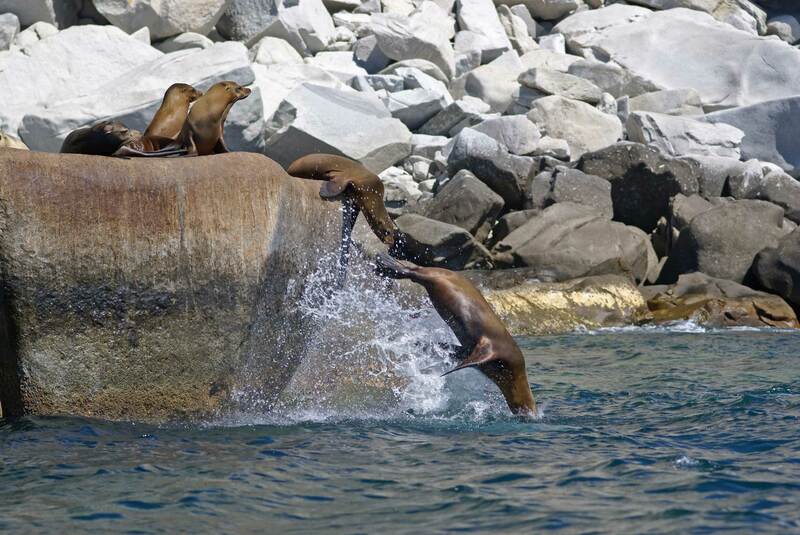 Our journey north continued to be defined by wildlife, from puffer fish and mobula rays in the sheltered island coves to a raucous colony of California sea lions taking refuge along the islet of La Lobera. As we sailed across the open seas towards Isla San Francisquito, we even passed a “lazy” minke whale spouting half-heartedly into the air. The Westward’s naturalist, Sarah Drummond, said the whale was most likely asleep. “Whales are voluntary breathers,” Sarah explained. Unlike humans (who can breathe while sleeping), whales must consciously exchange carbon dioxide for oxygen. To do this, they sleep by resting only half of their brain at a time. A less-welcome species made its appearance near San Francisquito. Black clouds of midges prevented the island and its neighbour, the much larger Isla San Jose, from being inhabitable. Yet the untenable living conditions on the islands were responsible for a fascinating settlement that had cropped up in between: the tiny fishing town on Isla Coyote, a speck of land that looked less like an island and more like a giant rock that had been thrust out of the sea. Devoid of water and vegetation, El Pardito or The Brown One (as it is known locally) is home to a settlement whose maximum population has never exceeded a couple dozen people. The Cuevas family has eked out a living on Pardito for most of the last 90 years, fishing the surrounding waters for rays, flounder, and shark and boating them to La Paz for sale. When we arrived on Pardito, three fishermen were cleaning and stripping sting rays for brining and salting. Sarah conversed in Spanish with the eldest, a moustached man named Pablo, and exchanged several jugs of fresh water for triggerfish for our dinner. Our group walked around the island and contemplated what life must be like so far from civilization. The challenges of living on Pardito were evident in the abandoned primary school and the ages of the remaining residents. The younger Cuevas generations no longer fish here, having moved to the Baja peninsula to pursue work. Despite the hardships they faced, the residents of Pardito were — to echo Steinbeck — “kind to us and considerate as only Mexicans can be.” Before we departed, I offered Pablo a small bag of lollies I had planned to give the now-absent children of the island. “Gracias,” said Pablo, smiling. Sarah later told me he said the gift gave him “sweet whiskers”. Back aboard the Westward, a leisurely journey north allowed us to add to our life lists when we spotted a sandbar-sized blue whale feeding in the waters of Parque Nacional Bahía de Loreto. Our last evening on the vessel was spent enjoying margaritas and fresh sea scallops as the pink sky slowly faded into starlight. I wandered onto the foredeck after the others had retired, watching the moon cast my shadow against the Westward’s prow. The distant lights of the city of Loreto — our next destination — hung like a string of yellow pearls above the calm water. After spending our first day back on the peninsula exploring the markets of Loreto, we piled into a passenger van and departed for the Pacific Coast. 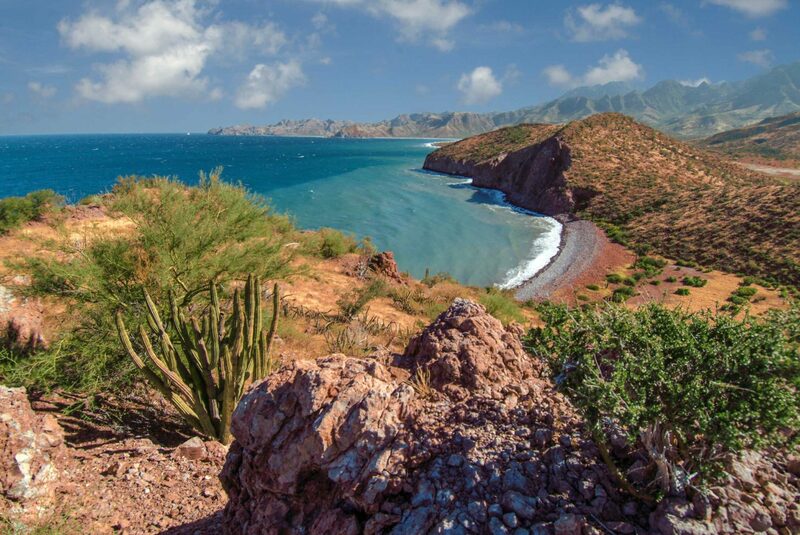 Our four-hour journey took us along Baja’s winding Highway 1 over the volcanic Sierra de la Giganta range. The slightly decrepit highway was an adventure in and of itself, the most memorable moment being when we passed a small pickup truck with a horse riding upright in the bed. 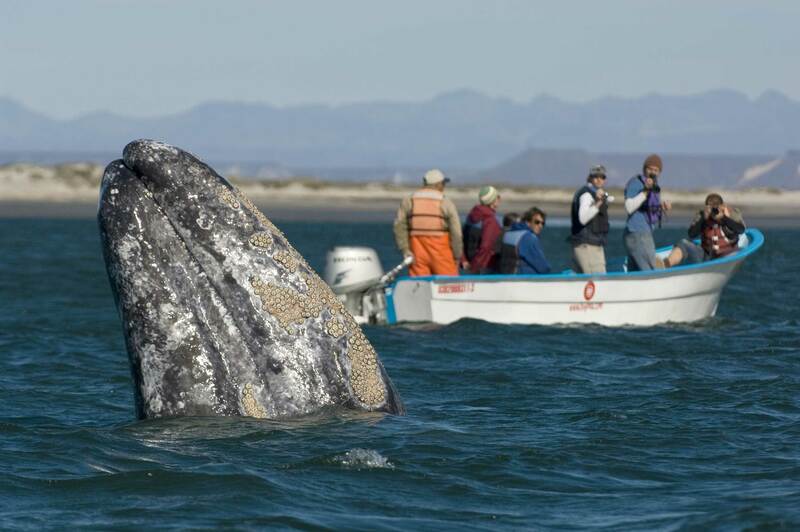 Our final excursion took place in the waters of San Ignacio Lagoon, a protected inlet that has long served as a nursery for grey whales and their calves. Our van pulled up to the small but hospitable Kuyima Ecotourism Base Camp, where we donned life jackets and stepped aboard pangas to depart into the lagoon. The first whale to approach our panga — a lone female — gave it an affectionate nudge with her nose. One of our group members touched her briefly before she descended back into the depths. The second curious female coyly stayed just out of reach as she passed from one side of our boat to the other. I bent over the side of the panga at the same moment she exhaled, resulting in a large net of white bubbles exploding over me. Our entire boat fell over laughing. “You’ll get it,” someone promised me. At last, the whale surfaced on the port side of the skiff, rolling slightly to one side and pressing her nose into the boat. I reached over. My hand met her smooth grey skin, fingers running across crusty barnacles near her flipper as I stroked the surface of the ocean giant. She was warm and surprisingly soft, and she waited patiently as our group caressed her. We called to her and laughed as we watched one another’s expressions of pure joy. Then, as if on a silent cue, she dipped beneath the surface and swam away. We shared our stories of San Ignacio Lagoon with Bill when we returned to Loreto for our departure. Although he hadn’t joined us on this excursion, he could vividly remember his own experience touching the grey whales. “It’s like holding your first child,” he said. From my window seat on the flight out of Loreto that evening, I watched the desert descend to the sea. The dry peaks were starkly juxtaposed against the turquoise water. This time, though, I noticed that the landscape still held a hint of green. Lauren’s voyage on the MV Westward was courtesy of Pacific Catalyst.